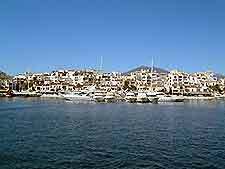 Marbella and the Costa del Sol are well connected to the rest of Spain by a variety of transport options, with most visitors to Marbella travelling by air, arriving at nearby Malaga Airport (AGP). Many holiday makers staying in Marbella often choose to rent a car, which is without doubt one of the best way to explore the area. For those wishing to take advantage of Marbella's inexpensive transport infrastructure, regular buses travel both around the city and to a number of nearby towns and cities, with long-distance buses and coaches also available. Taxis are extremely popular in Marbella and particularly convenient, being available on demand and easy to find. The main transport gateway into the Costa del Sol is Malaga Airport (AGP), which is located just over 48 km / 30 miles to the northeast of Marbella. One of Spain's most important airports, Malaga Airport (AGP) provides regular flights throughout the week, which travel to more than 100 different international cities, including many prominent Spanish airports, and also serves the resorts along the Costa del Sol, including Marbella. The main airlines operated at the airport include Air Berlin, Air Europa, Air France, Alitalia, Easy Jet, Lufthansa, Ryanair and Virgin Airlines. Ground transport at the airport includes trains to Fuengirola, together with airport bus transport and taxis which travel into nearby Marbella. Driving a car is one of the most popular methods of transport for those visiting the Marbella area and provides the freedom to travel when and where you choose. 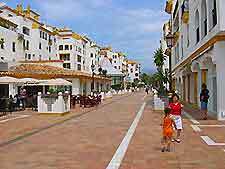 Many major roads surround Marbella and include the A-7, which runs to the east and west of the resort along the coastline, connecting Marbella with Fuengirola, Torremolinos and Malaga. The N-340 Costa del Sol toll motorway is also nearby. A selection of notable car hire transport companies operate desks at the airport and small cars always provide the best value for money. The main car rental companies available at Malaga Airport (AGP) include Avis Auto Rental, Budget Rent-a-Car, National Rent-a-Car, Europcar and also Hertz. Book your Malaga Car Rental here. Marbella's bus station stands on the ring road, in the northern side of the city. Regular buses travel to many areas of Marbella, including the historic Old Town district. Further buses travel outside of Marbella, to a range of destinations including Fuengirola (one hour), Puerto Banús (20 minutes), and Estepona (one hour), with bus stops located along the Avenida de Ricardo Soriano. A number of long-distance buses / coaches also travel from Marbella into other countries, including Portugal, France and Germany. Although there is no train service in Marbella, regular RENFE trains travel between Malaga and Fuengirola, with buses linking Marbella to the train stations. Further trains also travel from Fuengirola to Malaga Airport (AGP), usually departing every 30 minutes during the day. A selection of taxis can be found at the main taxi ranks at Malaga Airport, outside of both terminal buildings, and provide one of the most convenient ways to travel into nearby Marbella, with the journey lasting around 40 minutes. Further taxis are located around the Marbella resort, including a number which hover around outside large hotel complexes. 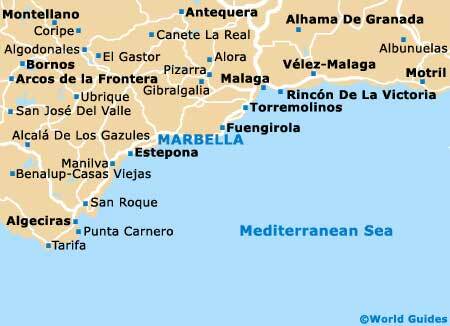 Taxis in Marbella can also often be hailed on the street and pre-booked in advance if required.